CLEVELAND (AP) Ashamed to show his face any longer, LeBron James stared at the floor as he headed toward the locker room before the final horn sounded. The Cavaliers have become an embarrassment. ”I’m lost for words,” James said after Cleveland was humiliated by the Houston Rockets, who rained down 19 3-pointers on the disconnected Cavaliers in a 120-88 blowout on Saturday night. 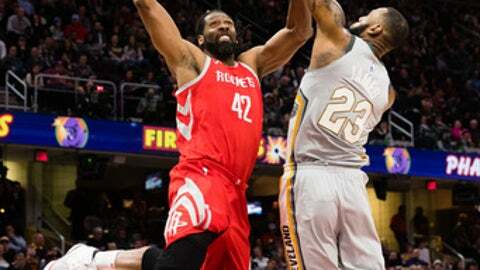 Chris Paul scored 22 points with 11 assists, Ryan Anderson added 21 points and the long-range Rockets became the latest team to manhandle the Cavaliers on national TV. James Harden only scored 16 – 15 below his league-leading average – but Houston rolled to its fourth straight win and improved to 11-2 since Jan. 8. Since losing at Golden State on Christmas, James and his teammates are 0-8 in network broadcasts and have been embarrassed in several matchups against quality teams. They lost by 28 at Minnesota, 34 in Toronto, 24 at home to Oklahoma City and 32 to the Rockets, who toyed with the defending Eastern Conference champs. Following the game, Cavs coach Tyronn Lue was asked if his team tried. Somber wouldn’t even describe the mood in the Cavaliers’ locker room, where players dressed quietly without any conversation. With the Rockets up 35 in the third quarter, the Cavs didn’t even bother to huddle during a timeout. Thomas and J.R. Smith sat at the middle of the scorer’s table while James and other players wandered near the bench area as Lue and his staff tried to figure what to do next. James doesn’t have any answers. The three-time champion said the situation is reminiscent of his first season with Miami. The Heat started 9-8 but finally found their groove. James isn’t so sure the Cavs can do the same. One of James’ closest friends, Paul isn’t writing the Cavs off just yet. Rockets: Harden, who went 1 for 11 on 3s, tweaked his ankle in the third quarter, but stayed in. … Paul passed Andre Miller (8,624) for ninth place on the career assists list. … G Eric Gordon (lower back stiffness) missed his second consecutive game, but coach Mike D’Antoni expects the team’s second-leading scorer to play Tuesday in Brooklyn. Cavaliers: Love met with reporters before the game and acknowledged he’s ”still down” after suffering his third broken hand in 10 seasons. He said the previous two times he recovered more quickly than expected. … Dwyane Wade passed Payton (21,813) points and moved into 32nd place on the career list. D’Antoni felt his team gained confidence after hitting several early 3-pointers. Houston finished 19 of 51 behind the line. Cavaliers: At Orlando on Tuesday.